Olive oil, one of the healthiest fats, because it can help lower total cholesterol, LDL -- or bad -- cholesterol, and even help control Type II diabetes. However, it is indeed possible to get too much of a good thing. If you consume too much olive oil, even high-quality extra virgin olive oil, you expose yourself to several health risks. With a little knowledge, you can make olive oil a part of your healthy diet without going overboard. Like all oils, extra virgin olive oil is an exceptionally dense source of calories. Olive oil, reports Livestrong.com MyPlate, contains 120 calories per tbsp. You could easily eat more than a single tbsp. by dipping bread into an oil-based dipping sauce. That's a problem, because if you don't burn off those calories through activity, they'll get stored as fat, causing you to gain weight, damaging your physical appearance and exposing you to all the health risks that come with being too heavy. While olive oil is better than animal-based fats such as butter or lard, too much of any kind of fat is bad for you. Excessive fat consumption -- which the American Heart Association defines as fat consumption in excess of 35 percent of your total caloric intake -- increases your risk of heart disease, heart attack, and stroke. That's why you should use olive oil instead of animal-based fats rather than in addition to them. 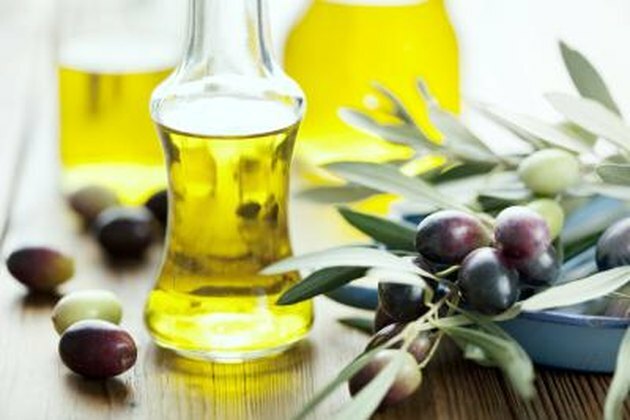 A more subtle danger associated with consuming too much olive oil is dietary imbalance. The human body digests fat at a slower rate than most other foods, reports author, medical doctor and former FDA commissioner David Kessler. This is why foods high in fat are so satisfying. The downside is that if you eat far too much extra virgin olive oil, you may not be as hungry for the whole grains, fruits, vegetables and lean meats you need to thrive. You can enjoy extra virgin olive oil without going overboard with it. By slightly adjusting your cooking technique, you can get the flavor of olive oil without the fat. "The Best Light Cookbook" recommends reducing the amount of oil you need to saute vegetables in half by turning down the flame and putting a lid on the pan, so that the vegetables own moisture helps to cook them. Using the juice from a jar of olives adds an savory olive flavor to salads, and you can reduce the amount of oil you need for oven-fried foods by directly brushing it on with a basting brush. Is Olive Oil Bad for High Blood Pressure and Cholesterol? How Much Coconut Oil Should I Eat Daily?